makcar wrote: Kane & Lynch: Dead Men™ PC version? xmath TEST "OFFSET2 + SIZE"
Bump in case the author of the original thread decides to show up. Last edited by flowersongs on Mon Mar 07, 2016 4:15 am, edited 1 time in total. Hey. I need a script to pull out all adpcm raw of file MS LASSET.MS2. The game Mortal Kombat Deception PS2. Tried to pull through PSound, but he did not adpsm raw pulls a ditch. Only converts in wav. But I need a adpcm raw. Here file https://yadi.sk/d/k2-qRmOwoRGoz. Supplemented. I need a script to pull not a bunch of files is a adpcm raw, and that they are in a file mst. Okay, I have opened textures from NBA Jam on fire edition in photoshop. 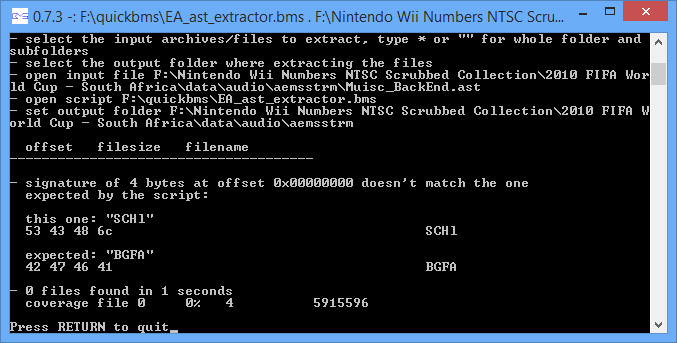 used xbox sdk kit to finally extract the tga files, and then bundle them back together to xpr2. This makes an xpr2 file with the same name, etc. I tried placing all the files, but the game freezes when loading a match an looking for the textures, it appears it WANTs the .AST file. NOW, I can someone please help me run this NBA extraction script in reverse to make an ast? I tried running itin quickbms with the Reimport batch, but it errored saying expected BGFA, this file is XPR2. The script worked to Extract the files, now I need to inject them or re-import them to .ast ... Please help me run this script in reverse and my project is complete. See if you can figure this out. Your Half-Life PS2 .pak extracting script only works on certain PAK files, others don't have the PAK header, maybe because they are compressed? Anyone know how to decompress/extract VALVE.PAK for example?